Society has set important rules for us to follow, and they haven’t changed much over the centuries. There are some things you just don’t do, especially with coworkers at a corporate event or at your friend’s birthday party. But strangely, these social offenses seem to translate into normal behaviour inside of escape rooms. It’s the strangest phenomenon to see someone who moments ago was polite and soft-spoken, devolve into a loud and destructive monster. Are you wondering what we’re talking about? Below is a list of common escape room behaviours that would be considered completely inappropriate in everyday life. Everyone has the temptation to collect things, some people (we’re not pointing fingers) even pocket things that don’t belong to them, but we’ve noticed that when people are playing an escape room this behaviour intensifies. We often observe people with their pockets full of locks they’ve opened, and other props that they’ve relied on earlier in the game. Now, our briefing videos tell you that each prop is only used once, so for players at Escape Games Canada this behaviour is especially irrational. Why would you hang onto something that you know you don’t need to use later on? We’re taught from a young age to take turns and listen when other people are speaking, but people always forget to do this in escape rooms. 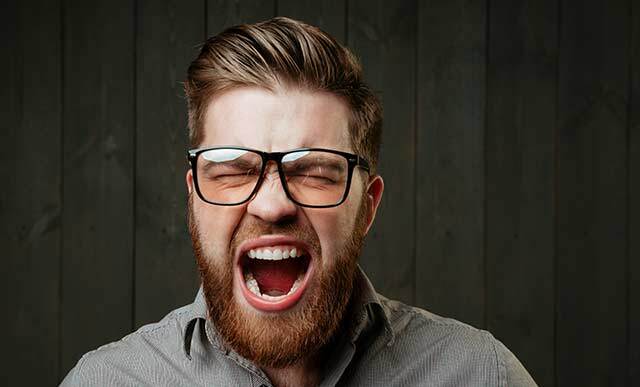 Some particularly polite groups speak in turn but too often escape groups devolve into screaming matches where everyone is shouting their idea as loud as possible to be heard. This communication tactic wouldn’t be successful in a meeting or in a classroom setting. In fact, people would probably get pissed off if someone behaved that way in the real world. When you go to a store, you might reach out to feel if a sweater is soft, or you might give produce a little squeeze, but do you run your hands all over walls and along door frames? Of course not, because that would be really weird. But crawling along the floor or feeling your way along a wall are perfectly normal behaviours for escape room players. All too often we see players turning over tables and chairs to check underneath, but in a facility that doesn’t hide information, like Escape Games Canada, there’s nothing to find. You wouldn’t go to the pharmacy and search behind the shelves, or start emptying bottles in search of the right product, but for some reason, people see it as a normal thing to do when they play in an escape room. Hoarding tops the list of inexcusable behaviors in escape rooms. Apart from locks and keys, we also find masks getting stolen. People do this inspite of cameras all around. It is really mystifying as to what drives them to take things that are not at all usable later on; perhaps they take it as souvenirs!